Pre-season friendly becomes rout as Buckingham knocks off the rust! Eleven players turned out for Charlie Wilson's validictory match before she leaves for Uni - she lead the girls as Captain and gave them an completely secure basis at the back. We will miss you! We had two new players in Frankie Marchant and Charlotte Pearson, both of whom will be great additions to the side. Buckingham very quickly established dominance but the first half stayed goalless as we struggled to find the finer finishing touches. A quick review at half time and the girls charged out for a second half goal-spree. The first goal after five minutes came from a lovely fluid move through the midfield from Cass and Elloise, passing the ball between them and finishing with a sharp pass into the Bicester D where Shania, ever lurking on the left post, chipped it into the goal. Next goal was a stunning blast from the edge of the D by Cassidy, high into the Bicester goal. Third goal was a very well deserved debut contribution from Frankie, and Shania finished the match with another display of a text book deflection from the post. 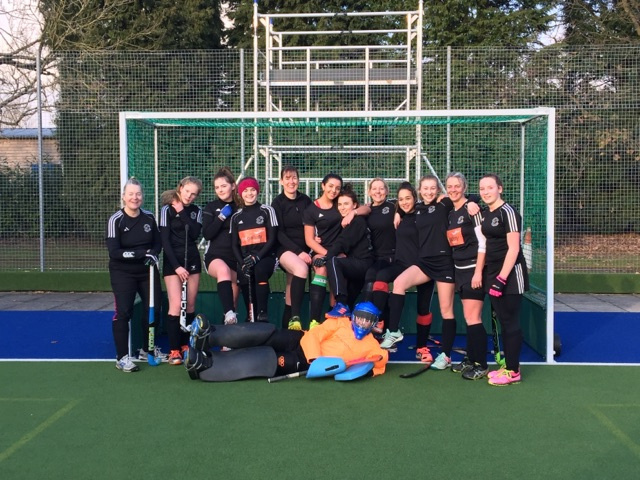 Everyone deserves a mention - Charlotte's confident work beside Charlie in defence, together with Helen who has found her real metier as a frustrater and smotherer of opposition attackers, kept Bicester away from our goal line for the whole match. Daisy's one touch of the ball in the match was a great kicked save which caused whoops of delight. Ruth and Zoe worked brilliantly in screen - Ruth perfecting the snappy clearance and Zoe's work rate right up and down the pitch earning her joint Player of the Match. Elloise was dominating at centre mid, and Emily quickly dusted off the holiday cobwebs to make a great contribution on the right wing. Shania and Frankie have both marked the team's card with their skills up front, and Cassidy got the other joint Player of the Match vote for being truely inspirational with her energy and willingness to take on anything and anyone to own the middle of the pitch for Buckingham. Well done girls, it was a joy to watch you. And thanks to John for coming to umpire us, much appreciated.